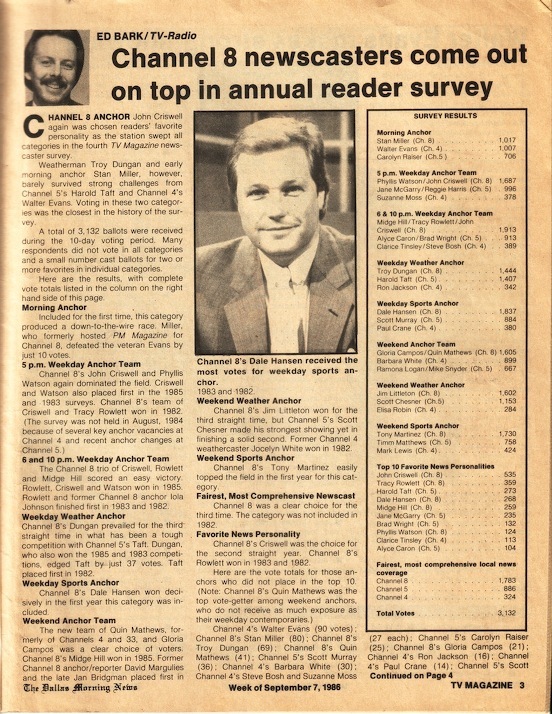 Note to readers: This September 1986 mail-in survey of readers' favorite D-FW news personalities and newscasts long pre-dated the Internet and for the most part, cable TV news. It required mail-in ballots, and they came in by the thousands during four separate "elections." Here's the last of them. 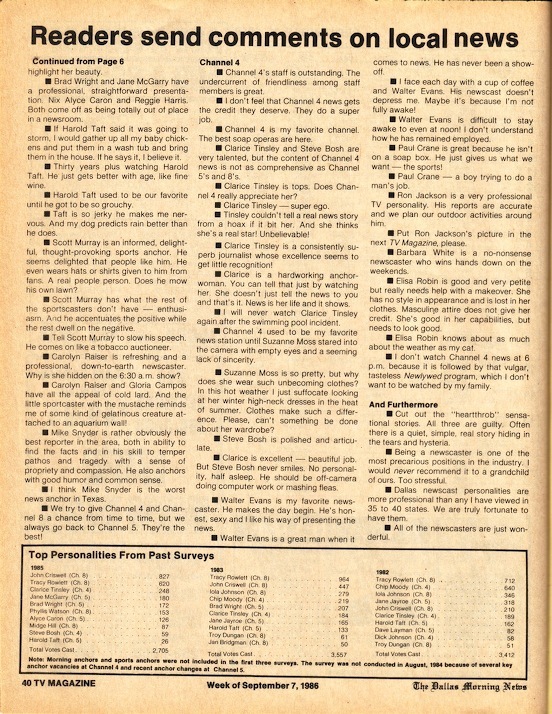 It lives on courtesy of a reader who re-discovered the 1986 survey -- perhaps during an archaeological dig -- and actually took the time to photograph and email it. It's reproduced here as large as possible, but a magnifying glass probably wouldn't hurt. Twenty-one Septembers later, vote-getters Tracy Rowlett, Clarice Tinsley, Dale Hansen, Jane McGarry and Gloria Campos remain very much a part of the local news landscape while Troy Dungan still pops in and out. Note some of the tart comments from readers and Ch. 8's dominance in times when Rowlett, Hansen, Dungan and John Criswell were all major players at the station. Meanwhile, the late Chip Moody worked at Ch. 4 in the earlier '80s before going to Houston for a while. He then returned to Dallas in 1987 for a too-brief, health-plagued stay at Ch. 8. 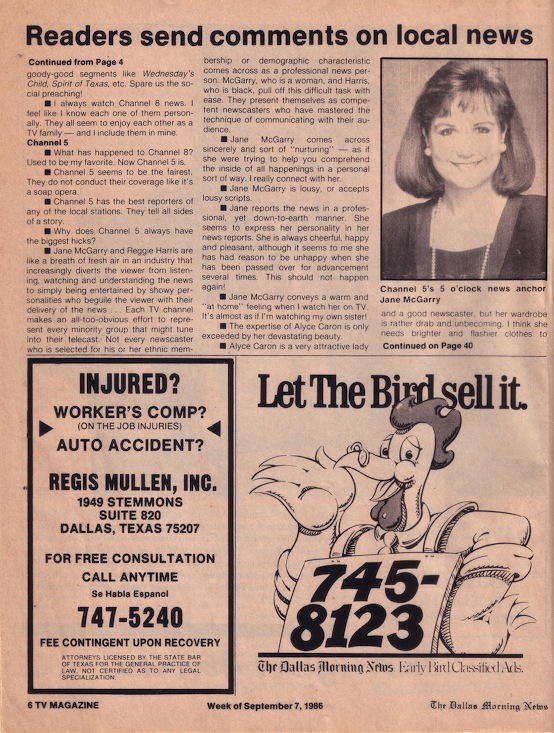 Rowlett or Criswell won each of the four "Favorite News Personalities" contests; Dungan and Ch. 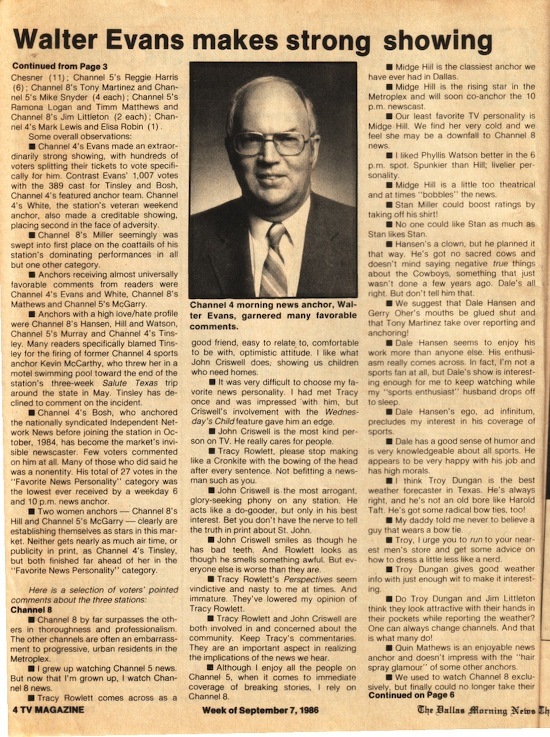 5's late, great Harold Taft always ran neck-and-neck in the top weathercaster competition. And your then mustachioed correspondent, with dedicated help from Norma Cavazos and Susan Verhault, always swore this was way too much work to ever do again. Finally we meant it.